"Writing chose me," said Gail Tsukiyama. "It came out of the need to learn about my heritage." Tsukiyama was born in San Francisco to a Chinese mother and an Americanized Japanese father from Hawaii. She lives in El Cerrito. When she went to college at San Francisco State she thought she'd major in film. "I saw life in images and stories and took film classes," she said recently, speaking at UC Davis fund-raiser for a new battered women's shelter. "Then I took a film writing class and realized it was much closer to what I wanted to do. So I moved from film to writing and wrote poetry throughout college. Poetry made up my master's thesis," she added. "Now I work on novels but sometimes a line of poetry come to me and I say: 'I wish I had time to write that.' Poetry gave me the foundation of language; I moved from film to poetry to short stories to novels." Tsukiyama has written three novels: "Women of the Silk," "The Samurai's Garden" and, her latest, "Night of Many Dreams." She said "Women of the Silk" came out of her desire to write about China and perhaps make some sense of her own personal history. She was raised culturally Chinese. So she began to do the research. "I decided to write about a period in Chinese history from 1900 forward, but I didn't know what period," she said. "I also wanted to write about the south of China. I don't speak Cantonese but I read it." In her research, Tsukiyama came upon two lines describing the lives of women silk workers - women who could live economically without husbands or families. These early feminists excited her and she began writing 150 pages of what she described as a cross between history and fiction. She was having trouble finding her voice. "Then in 1989 'The Joy Luck Club' was published and publishing houses were suddenly opened to Asian women writers," she said. "My mom says I never spoke very much as a child until I began writing. I found it very liberating to have a voice." So she wrote the story of Pei, who was given to the silk factory at age 8 by her father, a peasant farmer in South China. This took place just before Japan invaded China in 1937. "The silk subculture existed for 100 years," she said. "Many of these women who worked in the silk factories had a much better life than other women who were forced to marry. They had to work 14-hour days, yes, but they could also do things like go to the opera, send money home to their families, and meet other women from throughout China. They forged a sisterhood in a time when women didn't have much." Her second novel, "The Samurai's Garden," was an exploration of her less familiar Japanese heritage. "It was roughly based on my uncle's experience. He lived in Hong Kong and went to Japan when he was ill and lived there in a village for a year. From that seed came a fictional story. It was more difficult to write because I didn't know the Japanese culture and customs. "I began 'Women of the Silk' with culture but no story. Here I had a story but no culture." "The themes that continue to fascinate me are women who live apart from society," she said. Her latest book, "Night of Many Dreams," is set in Hong Kong and Macao and covers a period between 1940 and 1965. "I visited Hong Kong a lot when I was young," she said. "Those themes are showing up now." "Night of Many Dreams" concerns a family of five women who survive the Japanese occupation of Hong Kong and escape to Macao. Later, when the sisters grow up, one becomes a film actress in Hong Kong while the other moves to San Francisco to attend college. "There's a lot of food in this book," she says, laughing. "It's such a big metaphor for the culture." Tsukiyama said she is currently working on a sequel to "Women of the Silk." "I went through a period after 'Night of Many Dreams' when I didn't know what to write about," she said. "The Pei came back to me." The suggestion, subtle but unmistakable, of a lesbian relationship between Pei and her mentor, Lin, was made in the first book. At the conclusion of that book, however, Lin has been killed in a fire at the silk factory and Pei has met her friends' brother. Hmmm. Will Pei end up with Lin's brother? "I don't know if they end up together or not because I'm not done yet," she said. Stay tuned. April Sinclair will be the fourth and final woman in the series to visit UCD as part of the fund-raiser sponsored by the Women's Resources and Research Center. She'll be on campus April 15 at 7:30 p.m. in 1100 Social Sciences building. Tickets will be available at the door: $10 general, $8 students. To Order "Night of Many Dreams" (Hardcover) from Amazon [ Click Here ] links. To Order "The Samurai's Garden" (Paperback) from Amazon [ Click Here ] links. To Order "Women of the Silk" (paperback) from Amazon [ Click Here ] links. To Order "Women of the Silk" (Hardcover) from Amazon [ Click Here ] links. 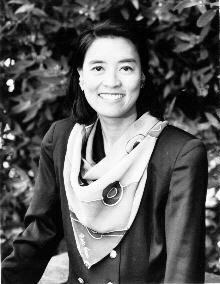 Gail Tsukiyama, author of "Night of Many Dreams" and "The Samurai's Garden" writes "to explore her dual heritage." She spoke at UC Davis in March of 1998. Tsukiyama is the third of four women writers invited to Davis for a fund-raising series of lectures for the battered women's shelter in Davis, CA. Her fictional books deal with women roles in historic China and Japan. Read Elisabeth Sherwin's recounting of Tsukiyama's words about her fictional works in "Gail Tsukiyama writes to explore her dual heritage," the March 29, 1998 PRINTED MATTER column. Photo by Mathew Spencer Wong.